While tablets aren’t as popular with adults these days, the market continues to thrive in other areas, including the kids tablet market. Parents who want to give their young kids a tablet are usually looking for a product that’s easy and fun to use for their child. They are also looking for something affordable and pretty rugged, while also featuring parental controls to keep their kids from checking out content on the internet that’s inappropriate for their age. The good news is there are a number of Android tablets for kids with all of these features and many more. Let’s take a look at the best current Android tablets for kids, primarily younger children in particular. Keep in mind even though these tablets are made for kids, it’s ultimately up to their parents to make sure the content and interactions their children have on the devices are appropriate. Amazon recently refreshed its entire lineup of Fire tablets, including its devices for children. The new $99 kids version of the Fire 7 tablet has a 7-inch 1,024 x 600 display, along with 1 GB of RAM and 16 GB of onboard storage, with a microSD card slot to add up to 25G GB of storage. It has a quad-core processor running at 1.2 GHz. It also has a VGA front-facing camera. a 2 MP rear-facing HD camera and a battery that’s supposed to last up to 8 hours on a single charge. It uses Amazon’s Fire OS, which is a fork of Android, and its own app store. The Fire 7 Tablet for Kids includes a rubber “kid-proof” case, in blue, pink, or yellow. Parents can set up to four individual profiles for their children, and the tablet comes with parental controls that can block access to videos and games until their kids reach certain educational goals. They can also set up bedtime curfews, along with ways to block access to social media and in-app purchases. Purchasing this Android tablet for kids comes with a pretty big perk: a free year of Amazon FreeTime Unlimited, with access to over 15,000 books, movies, TV shows, educational apps, and games for kids aged 3-12. The web browser in the tablet offers a curated and appropriate list of over 56,000 websites, videos, and YouTube videos. Finally, the tablet has a two year hardware guarantee — if it breaks for any reason, Amazon will replace it for free. The Amazon Fire HD 8 Tablet for Kids costs $129.99. It has an 8-inch 1,280 x 800 display and 32 GB of onboard storage, along with a battery that lasts up to 12 hours on a single charge. It also has dual stereo speakers with Dolby Atmos support and Fire OS. Otherwise, the hardware specs for the 8-inch tablet’s processor, microSD card slot and the choices of the “kid-proof” case are the same as the ones found on the Amazon Fire 7 Tablet for Kids. The 8-inch version also has the same two-year guarantee, the free year of Amazon FreeTime Unlimited, the parental controls and all of the other features found on the 7-inch model. Basically, you get a few hardware upgrades on this version for $30 more than the 7-inch tablet. The Amazon Fire HD 10 Tablet for Kids has a 10.1-inch 1080p Full HD display with a 1,920 x 1,200 resolution, along with a faster 1.8GHz processor, 2GB of RAM, 32GB of internal storage, a microSD card slot to add up to 256GB of storage, and up to 10 hours of battery life. You still get the same “kid-proof” cases found on the Amazon Fire 7 and 8 Tablets for Kids, along with the same two-year guarantee, the free year of Amazon FreeTime Unlimited, the parental controls and all of the other features found on the smaller devices. You can buy the Amazon Fire HD 10 Tablet for Kids normally for $199.99, but be sure to be on the lookout for Amazon’s frequent discounts. The Epic tablet comes from Leapfrog, which has been releasing educational electronic toys for year. Designed for kids age 3-9, it has a 7-inch 1,024 x 600 resolution display inside a hard bumper case, a quad-core processor running at 1.3 GHz, and 16 GB of storage, along with a microSD card slot to add more storage. Finally, it has 2 MP cameras on the front and back. The big negative about this tablet is that it runs on the very old Android 4.4 KitKat OS. If you can deal with buying an Android tablet for kids with an OS older than some of the kids it’s designed for, the Leapfrog Epic might be for your children. It comes pre-installed with over 20 apps made specifically for kids, with no in-app purchase features. It also features a kid-friendly web browser with parental controls, and the tablet also allows parents to get very specific on which apps and features can be used by kids. For example, it can set the tablet to let kids play with apps for 45 minutes a day, followed by 30 minutes of educational videos. Amazon is selling the Leapfrog Epic for $89.49. 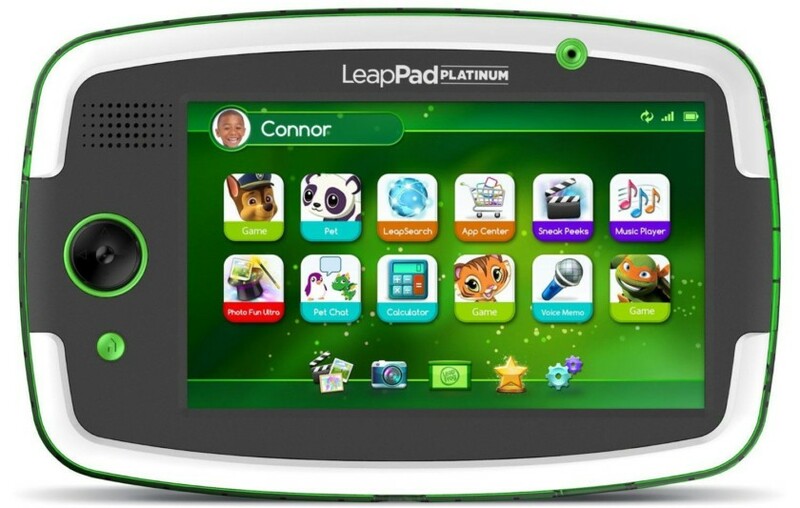 Another kid-friendly tablet from Leapfrog, the LeapPad Platinum is also designed for children aged 3-9. It has a 7-inch 1,024 x 600 screen but it has less onboard storage than the Leapfrog Epic at 8 GB, but still has a microSD card slot to add more storage. It also has a 2MP camera on the front and back and has a battery life of about 5 hours. As with the Epic, the LeapPad Platinum has lots of educational apps and games pre-loaded, along with a kid-friendly and safe web browser. This tablet, as the name suggests, comes from the PBS TV channel and has a 7-inch 1,024 x 600 display, 1GB of RAM, a quad-core 1.3 GHz processor, 16GB of storage, with the option to add more storage via the microSD card slot. The tablet uses Android 6.0 Marshmallow, which is still getting close to two years old, but not quite as long in the tooth as the Leapfrog Android tablets. The PBS KIDS tablet comes pre-loaded with over 23 games, along with 120 video clips, songs, and music videos. The case of the tablet is made of silicon, along with grips on either side so kids with small hands can firmly grip it. As with all of the tablets in this list, the PBS Kids tablet also comes with easy-to-use parental controls. It also has full access to the Google Play Store, if you want to use the tablet for your own needs. Amazon is currently selling the tablet for about $85. While Samsung has a number of Android tablets targeted towards adults, the company has also released a few of the best Android tablets for kids over the years. The 7-inch Galaxy Tab E Lite Kids Edition has a 1,024 x 600 display, 1GB of RAM, and 8GB of onboard storage, with a microSD card slot to add more storage. The battery is supposed to last up to nine hours on a single charge. The tablet comes with a soft bumper case that’s also easy to grip to help protect it from any drops from their owners. The Galaxy Tab E Lite Kids Edition also comes with a starter pack of more than 20 apps, along with a free three-month subscription to Samsung Kids, which includes content from DreamWorks Animation, Sesame Street, National Geographic, and more. Of course, the tablet comes with parental controls so they can set time limits for their kids. Parents can also select specific app categories that their children can access, and the tablet does not show any ads or in-app purchases. The only really bad part about this device is that it uses the old Android 4.4 KitKat OS. Amazon is currently selling the tablet for $127.99. The Contixo Kids Tablet not only has a protective rubber case surrounding the 7-inch tablet, but the corners also have some additional rubber protection, in case your kids run around with the device, Having that extra bit of safety could make all the difference. The tablet can access the Google Play Store, and parents can set up controls to make sure their children are only accessing and downloading the content that they should be using. Hardware wise, you are getting a 7-inch 1,024 x 600 tablet, with a 1.5GHz quad-core processor, 1GB of RAM and 8GB of onboard storage, with Android 6.0 Marshmallow out of the box. It has front and rear cameras, Bluetooth wireless hardware and parental control software for making sure your kids are not viewing content you don’t want them to see. 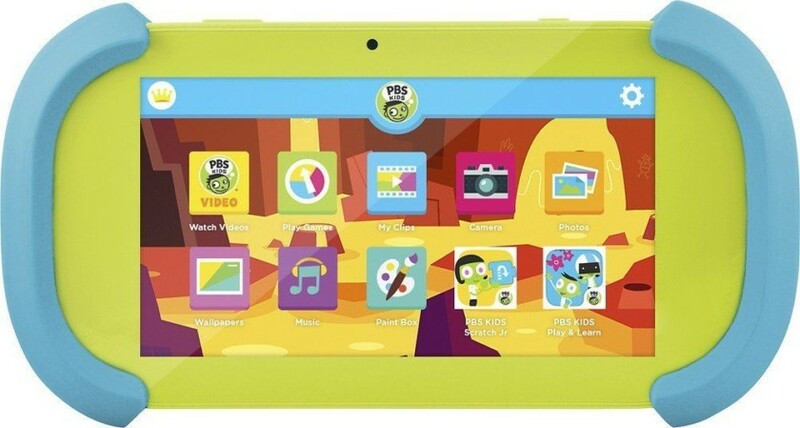 The Contixo Kids Tablet is available on Amazon for $59.99 in pink, blue and green cover colors. If you are signed up to use Verizon Wireless already, and you have kids, you might want to look into the Verizon Gizmotab tablet for your children. This tablet has a lot of higher end hardware and software compared to many of the tablets on this list, but it also has a much higher price tag. The Android 6.0 Marshmallow tablet has an 8-inch 1,920 x 1,200 display, a Qualcomm Snapdragon 617 processor running at 1.5 GHz, 3GB of RAM, and 16GB of storage, with a microSD card slot to add more storage. It also has an 8MP rear camera, a 5MP front facing camera, and a 5,100mAh battery that apparently lasts up to 14.5 hours on a single charge. Finally, it is the only tablet on this list that includes LTE wireless hardware, in case a Wi-Fi hotspot is not available. The tablet is protected via a rugged removable bumper case. It also comes pre-installed with a number of educational apps, and its UI lets kids open those apps inside a customizable 3D world, with a virtual clubhouse, arcade, and school. Parental controls allow them to set time limits for their kids, and reward them with additional playtime for each hour they spend using the Gizmotab for learning time. There’s also a dashboard to keep track of a kid’s tablet usage. As we mentioned, all of this comes at a higher price than the other tablets on this list. Verizon is selling the Gizmotab for $249.99 without a contract, $99.99 with a two-year contract or for payments of $10.41 a month for 24 months. There are certainly no shortage of Android tablets for kids, but with the exception of the Verizon Gizmotab, they tend to be on the lower end of the scale in terms of hardware and software. However, this is balanced by their lower cost, along with features like parental controls and kid-friendly UI and cases. If you are a parent, which of these tablets would you consider to buy for your kids? Which do you feel is the very best Android tablet for kids on the market right now? Let us know your picks in the comments!